The Friday Adorama Holiday deal du jour is the new condition Sekonic L-308X-U Flashmate Digital Light Meter offered for $189 with free shipping. No coupons, no rebates, just add to le shopping cart and proceed to le checkout page. The latest Adorama Snapshot deal is a big Lighting Gear sale featuring products from Flashpoint, Green Extreme, 3POD, GLOW (no relation to the Netflix show), ORLIT, and CLAR. Speaking of Adorama, they are offering the new condition Asus ROG Strix GL753 17.3″ Gaming Notebook Computer (i7-7700HQ 2.8GHz, 8GB RAM, 1TB HDD, GeForce GTX 1050 Ti with 4GB memory, W10 Home) for $1030 with free shipping. No rebates, no coupons, just add to cart and proceed to checkout during this promotion. The new condition Sony HVLF20M external flash for various Sony cameras is now down to $128 with free shipping by Amazon itself and others. 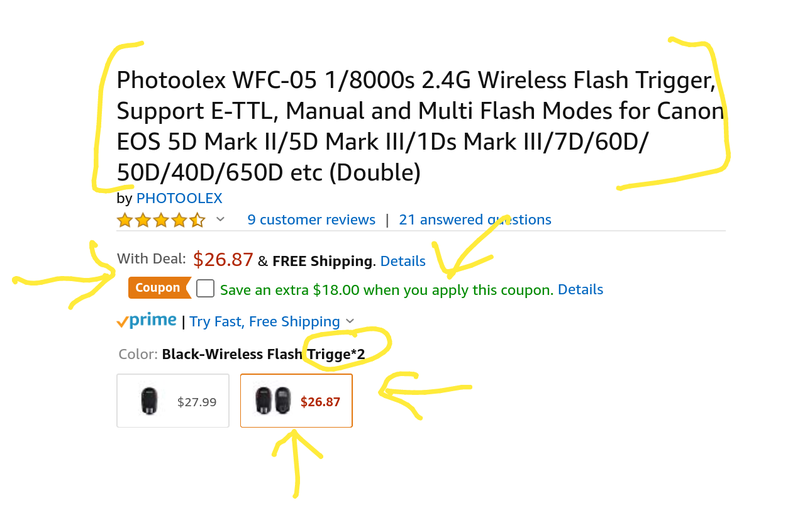 Amazon’s own offering has a limit of up to three per customer, but other retailers offer it for the same price in case you want more than three. Adorama is running another “Snapshot” flash sale. These typically last 24 hours or so and the current “Snapshot” sale is a sale on their various Flashpoint Flash and Lighting products. The price you see is the price you pay, no coupons, no mail-in rebates! The order deadline for shipment before they close is 3/30/18 at 12pm eastern. Into the Amazon Gold Box we go, where, until 5:50pm ET tonight, you can get the new condition GVBGear Pocket Camera Light Fixture On-Camera Light for $24.99 sold by “GVB Gear” with the order fulfilled by Amazon. Only this one of the three options on the listing is a lightning. The price before the sale was $40 when I posted the Lightning Deals schedule earlier today. Another Kickstarter project that has made the transition to the world of grown-ups (ha! ), the new condition Lumu Power Color & Light Meter is currently on sale for $250 with free expedited shipping at Adorama. This is a lightning-connector device, it turns your iPhone into a color-meter and a light-meter using the Lumu app. An iPhone with a working lightning connector is needed! On the budget side of lighting, Amazon itself is offering the 16-pack of Philips LED A19 light bulbs, frosted, 60W equivalent (8.5W actual), 800 lumens, 2700 Kelvin, Soft White, with E26 base for the very specific price of $21.60. Free shipping for Prime members or with a $25+ order [check $5 gadget posts for ideas if you want to climb over $25]. Limit up to six 16-packs per customer. This is not a lightning deal. The Fotodiox Amazon store is offering the new condition Fotodiox Pro 5-in-1 Reflector (22 inches) for $8 with free shipping for Prim members or with a $25+ order. You can buy as many as you like. As this is an old fashioned sale, expiration time is unknown. For those about to rock and lighting… Adorama is offering the new condition Photogenic StudioMax III AC/DC Wireless Studio Kit, model AKC640BK, with two AKC 320B Constant-Color Monolights, Umbrellas, Stands & Case, but Battery is NOT included, for $500 with free shipping and handling. “Lights, Camera, Action!” as the saying goes and it’s true! Because you can’t have cameras without light 🙂 On the lighting front, B&H Photo is offering the new condition Angler Steady Cool 2-Lamp Fluorescent Fixture 2-Light Kit for $239 with free expedited shipping for a limited time. This lightning deal expired… Happening now in the Gold Box, running until ends 5:30pm ET tonight you can get the new condition GVBGear Pocket On-Camera Light for $24.95 with free shipping for Prime members or with a $25+ order. Only this model of the three in the listing is on sale. The brand new ORLIT 250Ws KWIK Series Studio Flash With Bowens S Mount is now on sale for $170 with free expedited shipping at Adorama. No coupon, no rebate, just add to cart and proceed to checkout. Speaking of Adorama, they are offering the new condition Dell XPS 15.6″ Ultra Thin 4K Touchscreen Notebook (Core i7-7700HQ 2.8GHz, 16GB RAM, 512GB SSD, NVIDIA GeForce GTX 1050 4GB, W10 Home) for $1650 with free shipping and handling. On the Adorama front, they are offering the new condition ORLIT RoveLight RT 601 HSS (Non-TTL) Monolight with On Board Power (Bowens Mount) for $350 with free expedited shipping or for $30 more you can get it with a Canon or Nikon or Sony trigger. This among their latest WPPI 2018 specials. And now we are back to digesting B&H Photo WPPI specials until the Samsung MWC 2018 presentation begins around 12pm eastern today!